Paint bubbling on interior wall. Water causes many interior paint problems. One of the worst is peeling paint. If you want to know why water, this article will not only explain why water causes paint to peel in different situations. It will help you recognize where the most vulnerable spots are in your home. 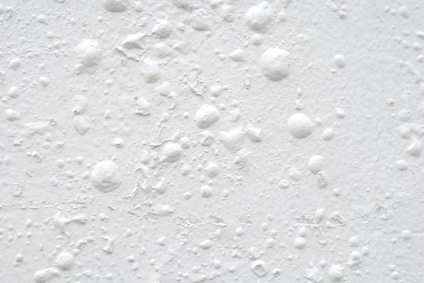 Drywall soaks up water like a sponge. The size and shape of the drywall changes as water is absorbed. This pulls and stretches the paint, causing microscopic tears. The water also applies pressure to the paint, pushing on the tears until they grow. Soon the paint loosens and lifts from the drywall surface. The result is what we see as peeling. Windows, especially single pane windows, sweat in the winter. Water runs down the glass and penetrates the wood behind between the glass and frame. Peeling will take place no matter how high a quality the primer or paint is. Stopping this water can be as easy as caulking the frame to the glass with a paintable clear caulk after painting. Also, try to reduce the humidity level within your home. Bathrooms always produce excessive humidity from baths and showers. The water vapor from these activities must be removed before it has a chance to escape into the attic, or under the floorboards. A properly sized exhaust fan can prevent many interior paint problems in these areas, including mold and mildew. If moisture is under the paint film, then sooner or later cracking, peeling or flaking will result. It is vital to stop and prevent further moisture in order to prevent interior paint from peeling. In the long run, the moisture will damage much more than the paint. It can lead to rot in the walls and floors of the high humidity room. Foundations are often a source of moisture. Many basements in older homes will have problems due to foundation cracks or lack of concrete sealer. In order to prevent interior peeling paint look to the exterior of your home first. Fixing this problem can be as simple as redirecting downspouts and increasing the slope of the landscaping away from the house. If the peeling recurs, water locking concrete primers can be used. These primers do work but prevention is a better solution. Other components of your home can also cause water damage. Roof leaks will appear as a water stain before causing serious damage. Air conditioning ducts will cause water to condensate on the metal surfaces if the humidity in your home is too high. Some of these situations are relatively easy for you to do something about. Some of the causes for peeling paint may require professional assistance with resolving. It’s important to remember that peeling paint is often a symptom of a more serious problem. It should be looked into carefully.